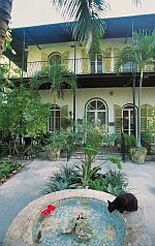 One of Key West's most popular attractions is the Ernest Hemingway House. For over a decade he used it as both his living quarters and his office. Hemingway's impact is much more pronounced than any of the other authors and artists who have lived in Key West. Today visitors enjoy this iconic man's home and grounds which also houses a museum. Built in 1851 by Marine architect and salvage wrecker Asa Tift, the house is on the second highest elevation on the island. Being 16 feet above sea level and built from limestone found right on the site has helped the house stand up to several hurricane and come away intact and with its basement dry. A swimming pool built in the 1930s at the cost of $20,000.00 is filled from a nearby saltwater well add even more character to the colonial Southern mansion style home. It was the island's first swimming pool. Hemingway's essence still permeates the house. Animal skins and other souvenirs from his hunting trips to Africa and out west still grace the walls and the furniture he brought from his travels in Europe are now antiques, but they all combine to gives visitors a sense of the author's personal style. 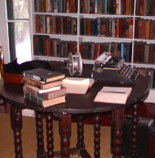 Visitors often remark that they feel his presence as they tour the rooms where he wrote so many of his best books. The author wrote short stories like 'The Snows of Kilimanjaro', 'The Short, Happy Life of Francis Macumber' and 'The Green Hills of Africa', 'To Have and Have Not', 'Death in the Afternoon' and 'For Whom the Bells Toll' in his studio on the second floor of a converted carriage house. Everything is as he left it. His Cuban cigar-maker’s chair, his Royal typewriter and other cherished item all look as if he just stepped away for a moment. Step into the world in which the author lived and worked. Called 'Papa' by the locals, Hemingway memorialized many of them in the novels he wrote during his time there. These were the people who taught him about his one of his greatest passions, big game sport fishing. One of his most popular novels is set in depression era Key West. It is called 'To Have And Have Not'. It included the entire range of people he knew on the island from the wreckers to the rich that made the island unique. Hemingway loved cats. Today you can visit the fountain he had built for his. They are now used by the dozens of six and seven toed cats that now roam the grounds. They are descended from Hemingway's cats some say. People from all over the world visit the house each year. It is a must see for anyone who travels to Key West. The Ernest Hemingway House and Museum takes you back in time and lets you experience one of Key West's most beloved and talked about attractions.